This river cruise highlighting the best of France is certainly grand! Begin your adventure on the captivating Marseille. On the Rhône River sits Arles, France—famous for inspiring the paintings of Van Gogh—and its 1st-century Roman Amphitheatre. On a guided tour of historical Avignon, see the 14th-century Palace of the Popes and, later on, join an excursion to the wine region of Chteauneuf du Pape. The city of Tournon is beautifully nestled among vineyards and you’ll go on a guided walk of this medieval treasure with plenty of Roman ruins. Lyon, France’s gastronomic capital is a showcase of medieval and Renaissance architecture. Take then a guided tour to Beaujolais and the following day to Chardonnay, where you will have the opportunity to taste local wines. A Master of Wine will travel with you on this first portion of your cruise and will hold lectures, tastings and will introduce you to the concept of food and wine pairing. 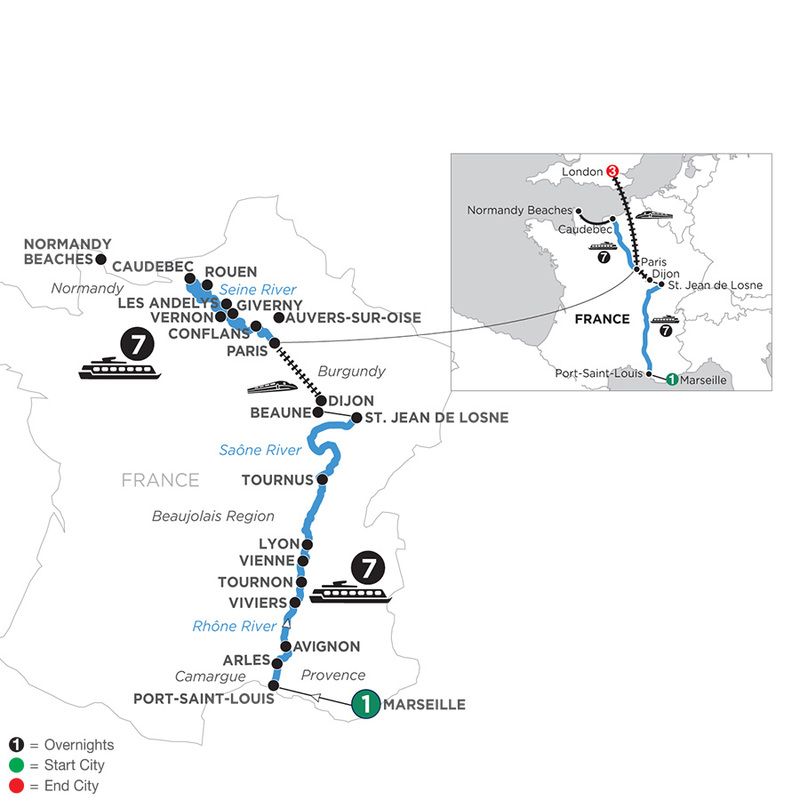 Continue on the Seine River, which offers a choice of excursion opportunities, such as a visit to the historic Normandy Landing Beaches, including Omaha Beach, the Point du Hoc monument, and the American Cemetery; a visit to delightful Les Andelys, Joan of Arc’s Rouen, and the choice between a visit to Vincent van Gogh’s Auvers-sur-Oise or Napoleon and Josephine’s Malmaison. On this French river cruise, you’ll enjoy wine, cheese, beautiful scenery, and stops in charming and historical parts of France, but your adventure would not be complete without a visit to Paris—one of the world’s most romantic and vibrant cities! A city tour will show you all the must-see sights. Then, transfer to London for three exciting nights. 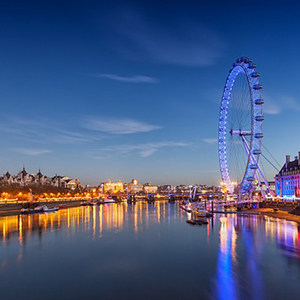 During your guided sightseeing of London, see the sights you cannot go home without seeing—Parliament, Big Ben, Westminster Abbey, Piccadilly Circus, and more, including VIP access to St. Paul’s Cathedral. You’ll have plenty of free time and your Monograms Local Host® will help make your vacation what you want it to be!